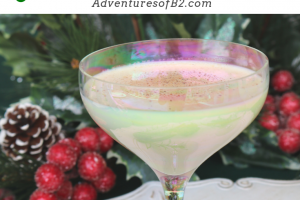 Vanilla Cranberry Mimosa is a surprisingly refreshing holiday cocktail that is perfect for any Christmas party. Super easy to make and only 3 ingredients, it’s guarenteed to be a holiday favorite recipe! Can you believe we are in the last month of the year? December is already upon us but it brings us something special. Something near and dear to every adult that is filled with Christmas cheer! Today is the start of the 25 drinks of Christmas special! Every day for the next 25 days, a new holiday cocktail will be posted for your enjoyment. All of these are perfect Christmas party drinks and will get anyone in the holiday spirit. So let’s get started! First up: Vanilla Cranberry Mimosas. This Christmas mimosa is surprisingly refreshing! I have to admit I was a little hesitant about this holiday drink. Mainly because I wasn’t sure if the vanilla would overpower the drink or just be a good fit at all. But I really enjoy the combination of vanilla vodka and cranberry juice mixed with champagne. I’m ashamed to say I had no cranberries to add to bring the whole cocktail full circle and give it more an aesthetic look. But, the raspberries are a great substitute and honestly worked out better than the cranberries. It gives the raspberries such a great flavor. 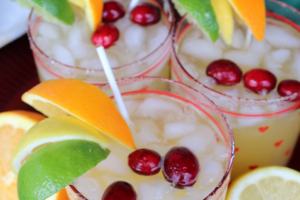 For other great options, try using the different flavored cranberry juices for a nice surprise. I personally think the cran-raspberry will go really well with these ingredients. 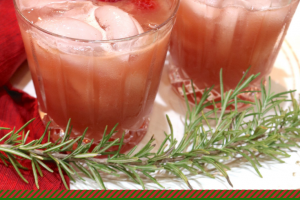 A surprisingly refreshing holiday cocktail and the perfect treat to bring to any holiday party! Top with cranberries or raspberries and serve to friends and family with Christmas cheer. Add vanilla vodka and cranberry juice. Fill the rest of the champagne flute with champagne. Garnish if desired with cranberries, raspberries or strawberries to garnish. Enjoy!